After spending a relaxing weekend in Blagoevgrad, it was time to spend another weekend traveling within Europe. Our next destination was Rome; an hour and a half flight from Sofia. Leaving on Friday afternoon, two other friends and I arrived in the Rome airport in the early evening. After depositing our baggage at the hostel (and exchanging our winter coats for lighter jackets), we walked in the direction of the Colosseum; searching for a restaurant with a nice view. Rounding a corner, my first sight of the extraordinary monument, bright against the night sky, took my breath away. Finding a nearby restaurant, we sat down and ate pasta and drank wine with the locals; enjoying the friendly atmosphere provided by both the servers as well as the patrons. Dinner was followed by gelato from another local shop; ending our first night in Rome on a sweet note. Awaking a little later than we had planned on Saturday; we began our day with a stop at the Trevi Fountain. Water from a first-century BC underground aqueduct feeds the most famous fountain in Rome built by Nicola Salvi in 1732. 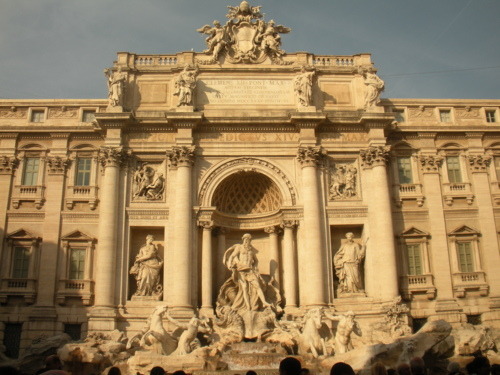 The well-known custom is to throw a coin into the fountain; assuring your return to the Eternal City. If you throw in a second coin, you will be sure to fall in love with an Italian. Throwing in a third coin with guarantee that you marry said person. Obviously, I dumped in my entire coin purse in hopes of marrying a dark, handsome man who speaks Italian! Following our stop at the Trevi Fountain, we continued onto Vatican City. Populated by just over 800 people on 110 acres, Vatican City is the world’s smallest independent state, both in area and population. In this country of churches, we entered the most dazzling of them all: St. Peter’s Basilica. Walking into the massive church (the entire Statue of Liberty could fit underneath the dome with room to spare) inspires awe in all who walk through the doors. Although this magnificent church is not the official center of the Roman Catholic world, it is the traditional location of the burial place of Peter (one of Jesus’ twelve disciples); making it an important pilgrimage location. Before returning to the hostel, we mailed postcards from the Vatican Post Office; a typical tourist activity. 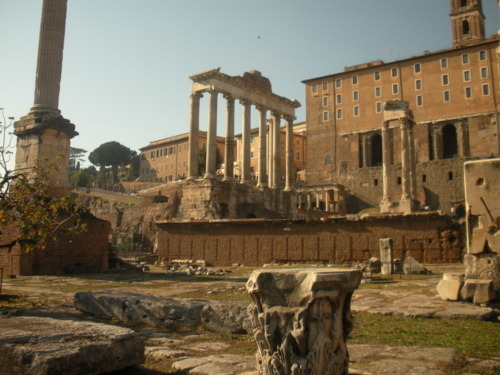 Sunday led us to the Roman Forum and the interior of the Colossuem. 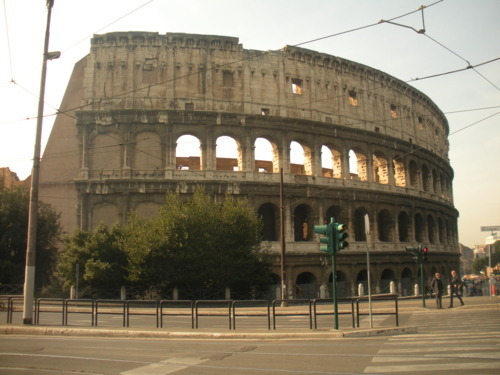 Originally known as the Flavian Amphitheatre, the construction was completed in 80 AD under the rule of Titus. Capable of seating 50,000 people, this great work of Roman architecture and engineering hosted gladiator contests and other public spectacles until the early medieval era. Moving from the Collossuem, our next stop was the Pantheon. Built over two thousand years ago, this building still holds the world’s largest unreinforced concrete dome. After seeing the Pantheon, we took a bus across the Tiber River into Trastevere (a district of Rome rich nightlife) to search for a restaurant at which to eat our last Italian dinner. Finding a nice pizzeria, we enjoyed delicious pizza and more wine; a perfect last night in Rome. On Monday, we arose early; ready to see more sights. Arriving at the Vatican Museums at 9:00 AM (when the doors open), we hurried through the first half of the museum in order to see the Sistine Chapel. Upon entering the room, you can’t help but to marvel at the wonderful works of art. Although Michelangelo resented the commission to paint the room, it became his crowning masterpiece. The bright colors and exquisite details of the paintings are truly astounding! Although this city used to be the leader of the western world, it has since fallen from its high position. Powerful emperors and popes have come and gone; some leaving behind a footprint, others simply remember as a line in a history book. Though these men were very influential in their time, there was one who was greater. Living his entire life in the Roman Empire, Jesus Christ created a movement that is still alive today. After leaving the earth, this man empowered his followers to spread the Good News to the ends of the earth. Beginning in Rome and extending around the world, Christianity did not die with the empire; the love which our Father shared with us through his son is just as relevant today as it was two thousand years ago!